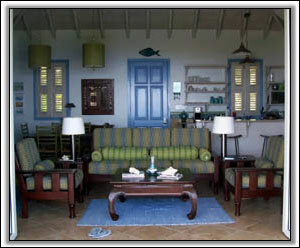 Whimsea House, 1,200 feet above sea level, on a cool mountainside in quiet Gingerland - Nevis, beautifully blends simple, traditional West Indian style with upscale, modern conveniences. 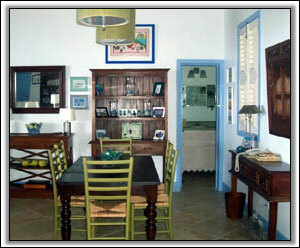 The spacious main floor, consisting of an open plan kitchen, living room, and dining room is tastefully decorated in colorful, casual island style. Nevis mahogany furniture, tiled floors, ceiling fans, hurricane lamps, hanging lanterns and screened-in wooden louvered windows add to the local ambiance. 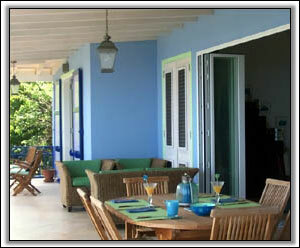 Large glass folding doors open onto the covered gallery, which has a stunning 180 degree view of the Caribbean Sea, and the islands of Montserrat, Antigua and the silvery Redonda. 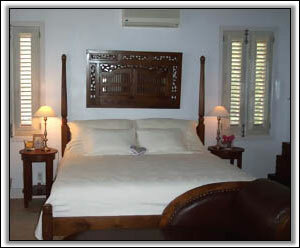 Each of the four bedrooms is furnished with Nevis handcrafted mahogany beds that are made up with luxury bedding and mosquito netting. Large armoires with drawers, full closets, bedside tables with reading lamps, ceiling fans, screened-in windows and unique artwork make these large bedrooms very practical, comfortable and romantic. Air-conditioning is rarely needed, but can be programmed automatically and individually. The outdoor dining and conversation areas are furnished with plenty of teak and sea grass pieces. 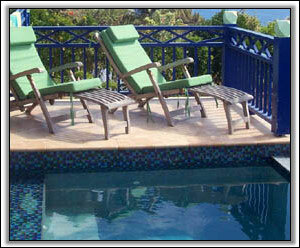 The centrally located infinity edge plunge pool and sunning deck are a relaxing alternative to a day on a Nevis beach. 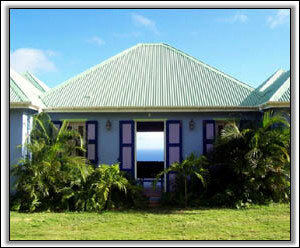 They provide a lovely spot for a cold rum punch, a good book, or a night of stargazing in the dark Nevis skies. The large, grassy yard has many tropical plants including fruit and palm trees, and a large mango tree that attracts the small Nevisian Vervet monkey. Hummingbirds and Morning Doves flit in and out of the flowering bushes providing quiet moments for observing nature. If you are looking for an enchanting and relaxing vacation spot, you must stay at one of the finest luxury villas in Nevis, Whimsea House. Main floor entry from living room and has King-sized bed, ensuite bath with shower and double sink. Louvered French doors open to balcony seating and ocean views. It is on the same level as the plunge pool, outdoor dining table and conversation area. Main floor entry from living room and has King-sized bed, ensuite bath with shower, louvered French doors that open to balcony seating and ocean views. It is on the same level as the plunge pool, outdoor dining table and conversation area. Garden level private entry with two twin-sized beds, ensuite bath with shower. The louvered French doors open to patio seating and private sunning area with loungers. A hammock provides a quiet spot for a nap. A private stairway connects to the main floor gallery and plunge pool. Garden level private entry and has two twin-sized beds, ensuite bath with shower. There is also a small room that is perfect for an extra sleeping area for a baby or child. The louvered French doors open to patio seating and private sunning area with loungers and a hammock for daydreaming. A private stairway connects to the main floor gallery and plunge pool. The main floor has a cathedral ceiling with lightly pickled beams, ceiling fans with lights, handmade Nevisian mahogany couch and chairs, handcrafted cabinets and bookshelves, large mahogany opium table, tiled floors with cotton rag rugs, and opens to a covered gallery, an 8' x 12 ' plunge pool and sunning deck. 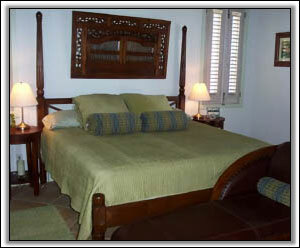 It is a very comfortable room with stunning views, unusual artwork, local pottery and natural objects to delight the eye. This open kitchen is fully equipped for cooking with coffee maker, blender, toaster, microwave, gas range and oven, refrigerator/freezer. There is seating for 6 at the kitchen table and and a kitchen counter seats 3 more on rattan stools. The large pantry adjacent to the kitchen has a washer/dryer, iron and ironing board. There is a half bath for convenience off the main living area. The outdoor covered and railed verandah has dining for 8 at the large teak table, with comfortable seating for 4 on the cushioned seagrass love seat and chairs. The sunning area has 4 teak steamer chairs and an 8' x 12' infinity edge plunge pool. "Whimsea" is up a small country lane in the hills of quiet Webbe's Ground Gingerland. It is a short 10 minutes to the grocery store, 20 minutes to several lovely island beaches and plantation inn restaurants. It is only 20 minutes to golf and restaurants at the beautiful Four Seasons Resort. The airport is 30 minutes away. Radio, CD player, safety deposit boxes, alarm clocks, telephone, fully equipped kitchen, washer/dryer, iron and ironing board, bed linens, bath towels, beach towels, board games, books. Maid service 2 mornings a week. 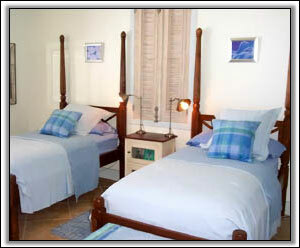 Whimsea House is not recommended for very young children because of the proximity of the living area to the pool.